Saxenda - has anyone tried it? Thread: Saxenda - has anyone tried it? 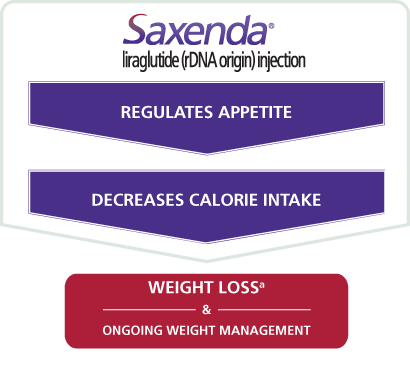 Saxenda® is different from weight management products that you may have taken in the past. It works like a hormone the body produces naturally that regulates appetite, known as glucagon-like-peptide (GLP-1).a By activating areas of your brain that regulate appetite, Saxenda® may make you feel less hungry, which can lead to lower calorie intake and weight loss.b Saxenda® can help you to not only lose weight, but keep it off as well. Your body naturally produces glucagon-like peptide-1 (GLP-1), which helps regulate your appetite. Saxenda® works like GLP-1. GLP-1 is thought to regulate one’s appetite. Calorie intake is a behavior that may be impacted by appetite. Learn more about all that SaxendaCare® offers. A once-daily, self-injectable medicine, Saxenda® comes in a prefilled pen. It’s the first and only FDA-approved weight-loss medicine in a pen that helps you lose weight and keep it off. Learn how to use Saxenda® and talk to your health care professional if you have any questions. Have questions about Saxenda® and the support available? Keto is much more fun. And isn't a nasty drug. MsDark, Novice and BrickHouse like this. While I despise all of the drug commercials that we have here, I love hearing the side effects. Still waiting for Bleeding from the eyes. explosive diarrhea is a favorite. witchcurlgirl, sputnik and pinkbunnyslippers like this. cherrypye, Lofty Bike, sprynkles and 2 others like this. um, saxenda has a black box warning. unless you are seriously obese, i don't understand the rationale for taking it. FDA approved doesn't mean it is ok or healthy. They approve bad things with horrible side affects and ingredients. I am. No side effects yet. Good luck OS. I hope that you continue to have no side effects. Thanks! It's only been about a month now. My doctor and I discussed all of the warnings pretty thoroughly before we agreed to try it. Most of the concerns come from reactions in mice exposed to massively high doses, and I was willing to give it a try. It comes with a year-long subscription to the Noom plan, too, but I haven't enrolled in that part yet. Orangeslice, i'm one week in and just occasional nausea at first and some fatigue but manageable. hope you are getting great results. i start shakeology and adding weights to my walking exercise. Looks too much like a damn insulin pen for my comfort. It's bascially just super strength Victoza (T2 DM injectable).